Nutritional yeast is a deactivated yeast cultured on sugarcane and molasses. “The finished product is heated, which kills the culture, but the nutrients are preserved throughout the process. The yeast has protein, fibre, selenium, zinc, and vitamin,” says Christopher Clark, Dubai-based nutrition expert, chef, and author of Nutritional Grail (Extropy Publishing). The yeast is popular with vegans and vegetarians because it’s often fortified with vitamin B12, otherwise available in meat, fish and poultry. Christopher says that it has a nutty, cheese-like taste, lending itself well to pesto and faux cheese sauces. He also recommends sprinkling it on top of mashed potatoes, pasta, and salads. Laura Holland, nutritionist and co-founder of beutifulbody.com (a website dedicated to health and wellness) also highly recommends this superfood. “It is extremely good for the central nervous system and digestion, but it’s not something you can eat on its own – the taste is not what you’re eating this for. It has to be blended into a smoothie or juice,” she says. This sweet superfood is the pollen of a number of flowers, collected by bees and treasured by herbalists and holistic health practitioners for its unique array of micronutrients. It is rich in vitamins and minerals, and protein, acting as a nourishing superfood, and providing strength and health benefits to the whole body in a very holistic way,” says Laura. Christopher agrees with this and says it has high amounts of rutin, an antioxidant that also has anti-inflammatory properties. The energy-boosting pollen supports the immune system, and can be eaten sprinkled over freshly cut fruit, topped over chia seed puddings, porridge, and smoothies. You can even eat a teaspoon of it as a snack, for a quick pick-me-up. Already quite popular with foodies in the know, the tiny seeds, taken from the plant Salvia Hispanica – related to the mint family – are packed with Omega-3 fatty acids, fibre, vitamins and minerals that have a great impact on the body. 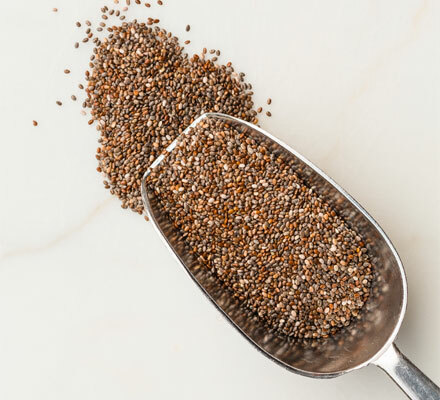 “The seeds have anti-inflammatory benefits, protect against the heart, keep the brain healthy, and support the central nervous system,” says Laura. Sprinkle the flavourless seeds on top of salads, puddings, and stir-frys to add texture, or make an easy, healthy pudding by mixing it with milk and refrigerating the mixture overnight. The scientific name of cacao is theobroma, which translates into food of the gods. “Cacao is usually paired with sugar, which makes it not such a healthy choice. This problem is solved with raw cacao chunks or nibs,” says Christopher. With a bitter, slightly chocolate-y taste and crunchy texture, cacao offers heart-healthy fat, magnesium, flavonols, and antioxidants. Laura highly recommends cacao nibs as they are rich in magnesium and iron, which are both vital for women’s hormonal health. The nibs also provide energy, help balance sugar levels in the body, and aid with weight loss. Eat it cut into slivers with Greek yoghurt, porridge, or fresh fruit. This light brown powder made from a root is native to Peru. It is sometimes referred to as Peruvian ginseng, and balances hormones, while increasing fertility too. “The root harks back to ancient Incan times, and was consumed because it was a potent source of vitamin C, potassium, and protein,” says Christopher. With a caramel-like flavour, maca can be added to smoothies or sprinkled over fruit, yogurt, or cereal. The antioxidant-rich dark purple powder – from ground maqui berries – hails from South America. “It helps aid weight loss, repairs cells, detoxifies the system, and clears the skin, thanks to the wealth of minerals and vitamins it contains, including Vitamin C, calcium, iron and potassium,” says Laura. The powder has a fruity flavour, so add it to juices, smoothies, and desserts, or blend it with cocoa powder, and sprinkle it on top of your favourite cereal. Green tea is one of nature’s most powerful antioxidants, but steeping green tea leaves in hot water only extracts a fraction of the plant’s full potency. Matcha comes from green tea leaves, which are ground into a fine powder. The powder has chlorophyll and amino acids which lends it a rich, bitter taste, followed by a slight sweetness – it is an acquired taste. “One teaspoon of matcha is roughly equivalent to drinking ten cups of green tea, with respect to antioxidants,” says Christopher. It is a versatile superfood, and can be eaten with yoghurt, mashed into guacamole, stirred into salad dressing, and mixed into smoothies.